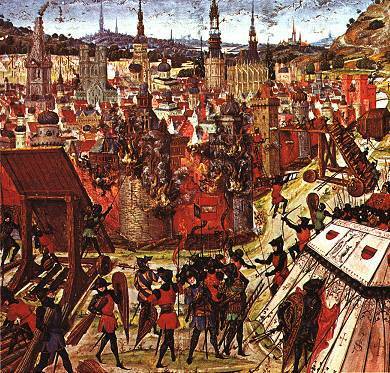 At a local level, the preaching of the First Crusade ignited violence against Jews, which some historians call "the first Holocaust". At the end of 1095 and beginning of 1096, months before the departure of the official crusade in August, there were attacks on Jewish communities in France and Germany. 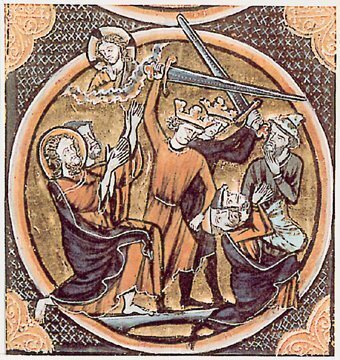 In May 1096, Emicho of Flonheim (sometimes incorrectly known as Emicho of Leiningen) attacked the Jews at Speyer and Worms. Other unofficial crusaders from Swabia, led by Hartmann of Dillingen, along with French, English, Lotharingian and Flemish volunteers, led by Drogo of Nesle and William the Carpenter, as well as many locals, joined Emicho in the destruction of the Jewish community of Mainz at the end of May. In Mainz, one Jewish woman killed her children rather than see them killed; the chief rabbi, Kalonymos, was also killed. Count Emicho (not to be confused with Bishop Emicho of Leiningen), was a count in the Rhineland in the late 11th century and the leader of the "German Crusade" in 1096. He is also commonly referred to as Count Emicho of Leiningen. The original idea for the First Crusade that had been preached by Pope Urban II at the Council of Clermont in 1095 had already turned into a much different popular movement, led by Peter the Hermit. Peter's preaching of the Crusade spread much more quickly than the official versions of Urban's call. Peter's version, which probably involved the Second Coming of Jesus, influenced Emicho, who spread his own story that Christ had appeared to him. Christ promised to crown him emperor, and would help him convert the Jews of Europe, if Emicho would join the Crusade.